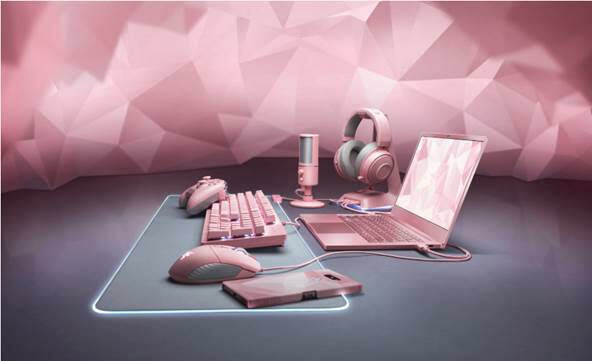 (Hong Kong, 30 January 2019) – Razer™ (“Razer” or the “Company”, HKEX stock code: 1337), the world’s leading lifestyle brand for gamers, today unveiled the latest high-performance gaming gear and accessories to be given the popular Quartz Pink treatment. Fans on the quest for Quartz to refresh their setups with bold color themes – balancing power in pink. We’ve paid attention. With more than double the gear available this year, one can enjoy a new series that lets you stand out even further from the crowd…in style. Our bestselling soft gaming mouse mat, powered by Razer Chroma™—ready to illuminate every victory in a stunning spectrum of colors. Watch your game light up with vivid brilliance as you swipe across the Razer Goliathus Chroma with speed and precision. The 3rd generation Razer Kraken is the wired headset for competitive gamers. Its large 50mm drivers deliver powerful and clear sound. It’s engineered for long-lasting comfort with cooling-gel cushions. A retractable microphone ensures your shotcalls are always delivered in absolute clarity. The Razer Raiju Tournament Edition is the first fully modular wireless PlayStation 4 controller to have a mobile configuration app, enabling control from remapping multi-function buttons to adjusting sensitivity clutch options. Mecha-Tactile Action Buttons provide a soft cushioned touch with crisp tactile feedback. The Raiju Tournament Edition also delivers total control with 4 remappable multi-function buttons and Hair Trigger Mode for quick-firing action. The Razer Raiju Tournament is available in Europe, Asia and Oceania.